Start the Summer baseball season with a Disney Baseball Tournament! Disney Memorial Day Baseball Classic at ESPN Wide World of Sports Complex blends ESPN entertainment with the Walt Disney World® Resort! Travel Package: Anyone listed on the team roster must book through Disney Sports Travel to participate in the tournament. Visit the Host Hotel and Travel Package tab to learn how to save big on team registration fees! The Baseball Sales team will review all applications and notify your team of its status as soon as possible. Upon acceptance into the tournament, your team will receive an invoice for the entry fee, which must be paid in full to guarantee your spot. The entry fee can be refunded until April 19th, if we are notified in writing. If you have questions about the application process, please call 407-938-3802 for assistance. 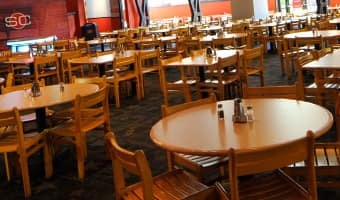 *Events may be subject to availability, capacity limits, eligibility requirements, and may be subject to delay, change, or cancellation for inclement weather. Application deadline subject to change due to volume of applications and event capacity. In the event that an Age Division Bracket does not attain an adequate number of registered teams, the Tournament Director shall notify those registered teams as soon as possible. The teams will be given the option of playing up if available or receiving a refund. All event participants (coaches and athletes) are required to book a travel package through Disney Sports Travel to participate in the tournament. You may also contact Disney Sports Travel at 407-939-7810, or email wdw.disney.sports.travel@disneysports.com for more information. A Disney Sports Travel Coordinator will be able to assist you with ticket upgrades, additional room nights, vehicle rentals and airfare options. Best of all, specially priced packages are also available for all members of your travel party! 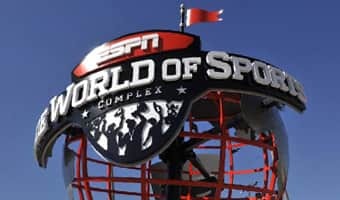 Spectators purchasing the travel package have the option of adding the ESPN Wide World of Sports Complex length-of-event (LOE) ticket for the event to the package. *Pricing based on attendee purchase of the Disney Memorial Day Baseball Base package compared to attendee purchasing each package component individually. Packages subject to availability. Packages cannot be combined with any other single registration offers, promotions, or discounts. Offer expires April 19, 2019. Guests who do not stay at a Walt Disney World® Resort will be responsible for their own transportation. Guests who purchase a travel package are eligible for Disney's Magical Express® and will receive complimentary event transportation between their resort and ESPN Wide World of Sports Complex. 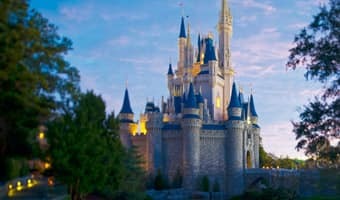 Disney's Magical Express offers the perfect game plan for a hassle-free arrival to and from Orlando International Airport. This exclusive, complimentary shuttle and luggage delivery service conveniently provides transportation for your team from Orlando International Airport to and from Walt Disney World® owned and operated resorts. Schedules will be released approximately 10 days prior to competition. View schedules here once released. *Subject to change. This is a general idea of each day's schedule only. Register for Disney Memorial Day Baseball Classic and submit registration fee once accepted. Contact Disney Sports Travel at 407-939-7810 or email wdw.disney.sports.travel@disneysports.com to book your hotel accommodations or travel packages. Your Disney Sports Travel Coordinator will see you through the booking process. Finalize roster and upload completed participant waivers, coach waivers, and birth certificates to GotSport prior to May 5th for Express Check-in. Spectator admission is required for all tournament games at ESPN Wide World of Sports Complex. Length-of-Event tournament passes (LOE) allow for admission to all days of the tournament. LOE and daily admission tickets are non-refundable/non-exchangeable, regardless of number of days your team competes. Spectators purchasing the travel package have the option of adding the "length-of-event (LOE) ticket to the package. Spectators can purchase their packages through Disney Sports Travel by calling 407-939-7810. Teams are now required to utilize Express Check-in to submit required documents for Disney Memorial Day Baseball Classic. Coaches are required to upload both the participant and coach waiver forms, as well as proof of age documents into the team's GotSport account prior to May 3th, 2019. A team representative will still be required to attend on-site check-in to do final verification of the team's roster and to receive athlete and coach credentials that grant access to ESPN Wide World of Sports for competition. For additional details, click on the link below. On-site registration will take place May 24th from 4 - 7pm in Champion Stadium at ESPN Wide World of Sports Complex. The tournament director and umpire in chief will be present to answer any tournament related questions. In order to expedite on-site event check-in, all teams must upload all required documents into their GotSport team account by May 5th, 2019. For more information please visit the Check-in Tab. Anyone appearing on the team roster is required to sign an event waiver. This includes athletes, coaches, bat boys/girls, team managers and scorekeepers. Waivers may be downloaded at the links below and must be uploaded into GotSport prior to May 5th. A maximum of 20 players and 4 non-players (i.e., coaches, scorekeepers, managers) will be allowed per team. A maximum of 2 bat boys/girls will be allowed per team and are required to be listed on team roster as well as have a waiver completed. To maintain the integrity of the event, all participating players are required to submit a copy of their passports or a photo ID along with a birth certificate confirming their age and eligibility. These documents must be uploaded online by May 5th. Failure to meet any of these requirements will render a player ineligible to participate in the tournament. Any team found to be using an ineligible player would forfeit all Disney Baseball Tournament games in which the ineligible player has participated. Registering as a Guest Player does not guarantee a spot in Disney Memorial Day Baseball Classic. Open to teams consisting of up to 20 players of proper eligibility. Please see rules for eligibility requirement. Ages 6-16 may participate. *Based on age as of April 30, 2019.